We’ve gone through great length to thoroughly review wedge pillows for infants. As every child has different needs, we’ve also stopped short of recommendations. Please take your time to read the reviews and visit the amazon links to get a feel of what other parents have to say. You can then make an educated decision on what will work best for you and your baby. Is your newborn suffering from acid reflux, keeping both the baby and you up at night? No one wants to hear their infant cry from a painful case of reflux or colic while depriving you both of peace and sleep. If your baby needs help sleeping soundly, consider using a remedy that you’d use for yourself: a bed wedge. Wedge pillows are proven to help calm symptoms of acid reflux by elevating the torso to keep the esophagus above the stomach, making it more difficult for unkind stomach acids to climb up the throat. The same physical effect is successful in infants, who often suffer from acid reflux, particularly at night. Read on to find out more about the “Sleepy Slope” Cher Bébé Oval Bassinet Wedge Pillow and how it can help your newborn. The “Sleepy Slope” Cher Bébé Oval Bassinet Wedge Pillow is a baby bed wedge (or crib wedge) with a 13-degree slope. This degree is slight enough to still be comfortable for a small infant body, yet also steep enough to properly align the baby’s body to position the head and upper body above the stomach. This helps to relieve acid reflux symptoms and reduce vomiting, as well as promote healthy digestion, which can additionally ease gassy babies. The “Sleepy Slope” is meant to go underneath the bassinet mattress, for a smooth, comfy slope all over. The wedge measures 14.5 inches across by 12.2 inches long by 2.5 inches high, at its peak, and it weighs a mere 15.2 ounces (less than a pound!). This means that it will perfectly fit 15-inch wide bassinets, offering coverage across the whole sleeping surface to ensure that, even if the baby rolls, he or she will still be supported. The “Sleepy Slope” is primarily cotton – featuring a 100% cotton outer cover and nylon inner cover – and its core is composed of sturdy foam that is soft enough to be comfortable but firm enough to keep its shape. The “Sleepy Slope” is designed with your baby in mind. It boasts two covers – one plush, cotton outer cover, and one practical nylon cover underneath – each designed to make your life (and your clean-up) easier. The cotton cover is machine-washable, and the nylon shield makes messy baby accidents a breeze to wipe away. The “Sleepy Slope” is free of latex, BPA, lead, cadmium, and phthalate, and has been approved by the United States Consumer Product Safety Commission. It is also free of fire retardants, which might seem strange, but it actually prevents exposing your baby to harsh chemicals at a very close distance while they sleep. All these details help to keep your baby safer and healthier. What’s more, customers just love this pillow! With a whopping 4.7 stars out of 5 on Amazon.com, people are simply going nuts for the quality and results of the “Sleepy Slope.” One recent happy purchaser said it helped their baby sleep for two hours at a time instead of the usual fifteen minutes! This goes to show how effective using a bassinet wedge – and particularly, a good one – can be. Getting a sloped sleep positioner can be on the dangerous side, as side fixtures can suffocate the infant if he or she rolls into sleep positioner wall while sleeping. The “Sleepy Slope” is safer because of its flat surface, which allows the baby to roll without danger of asphyxiation. In addition to the allure and prestige of its sleek designer packaging, the “Sleepy Slope” Cher Bébé Oval Bassinet Wedge Pillow also comes with a helpful e-book. This is full of tips and tricks, as well as useful definitions of the afflictions that can be treated with the “Sleepy Slope.” Education is important at every step of parenting, so a free e-book is no mere piece of extra packaging. Why should I consider the “Sleepy Slope” Cher Bébé Oval Bassinet Wedge Pillow? First and foremost, it’s hypoallergenic, which means that there’s little to no risk in placing this in your suffering baby’s bassinet. Its carefully designed no-skid bottom helps the wedge stay put in case your baby fusses or turns throughout the night. The “Sleepy Slope” is also easy to clean up in the case of newborn messes or accidents. But most of all, it’s already helped so many customers give their babies a more restful night’s sleep and a break from painful acid reflux symptoms. For $32.99, the “Sleepy Slope” Cher Bébé Oval Bassinet Wedge Pillow offers premium design, quality, materials, and results for a rather affordable price. Its quilted cotton cover and water-resistant inner shield make clean-up and maintenance a breeze, and the durable foam core won’t ever lose its powerful shape. For babies suffering from acid reflux, GERD, colic, gassiness, or digestive issues, the “Sleepy Slope” can help ease their pain and create a more peaceful night’s sleep for your baby and you. Happy customers agree – the “Sleepy Slope” really does make a big difference in their babies’ slumber. With Amazon Prime, you can get this pillow delivered right to your door in as little as two days (or sometimes less! ), so what have you got to lose? Babies often spit up after eating too quickly or too much, and that’s normal. But sometimes babies can vomit more regularly, even apart from food consumption, particularly when they are still less than a year old. This can be caused by acid reflux or GERD due to digestive issues and poor sleeping positions. Even a small adjustment to the latter can help fix the quality and health of your baby and his or her symptoms, which is where the MyBlissBaby Baby Bassinet Wedge comes into play. The MyBlissBaby Baby Bassinet Wedge is a quality foam wedge designed to prop up your baby’s upper body while he or she is lying in his or her bassinet. The pillow functions just as an adult bed wedge or wedge pillow would, meaning that it helps to relieve symptoms of acid reflux or other issues related to digestion by using simple (and safe) science. This MyBlissBaby wedge positions the child at a slope of 12 degrees, which is also the incline recommended for newborns by pediatricians. This is not by happenstance; the MyBlissBaby Baby Bassinet Wede was designed using the best science and intel available in order to ensure that your baby (and you!) can sleep more soundly each night. The MyBabyBliss wedge is meant to go underneath the bassinet mattress. This helps to create a natural, gradual sloping in the mattress itself without introducing an additional piece into the bassinet. This leaves more room for baby, less risk of budging, and easier clean-up down the road when the inevitable mess comes to pass. Placing the wedge underneath the mattress will also reduce risk of suffocation, which is an important issue to be vigilant about when caring for a newborn. The MyBabyBliss wedge features a “non-skid bottom,” which helps prevent your baby from involuntarily moving around throughout the night, making a more consistent night’s sleep more attainable for both of you. The MyBlissBaby Baby Bassinet Wedge was actually designed by a mother, so you know that you’ll get the most in terms of quality and function. Moms don’t have time to shop around for the best of something, only to need to buy a companion piece to supplement lacking features discovered later on. Mothers, especially single moms, can tend to rely on others in their position for their opinions and recommendations. The good news? This bassinet wedge has been mom-approved from the start. In addition to this MyBlissBaby wedge’s gold star from mom, it also boasts 4 out of 5 stars on Amazon.com. Many happy customers (and moms) have reported satisfaction with their order of the bassinet wedge. Lucky for you, the MyBlissBaby Baby Bassinet Wedge is only $28.90 – this is not even on the expensive end of the spectrum, but the wedge is still made of durable, high-density foam and even comes with two covers! This product from MyBlissBaby is also available on Amazon Prime, which means your baby can be using this quality wedge in two days or less – and mom gets free shipping. It’s a win-win! Even without being the most expensive bassinet wedge on the market, the MyBlissBaby Baby Bassinet Wedge still comes with plenty of additional features and perks. As mentioned, and like a few of its competitors, this bassinet wedge boasts two layers of protection. The innermost cover is a waterproof yet breathable shield, which makes unwanted messes easier to clean up. The outer cover is 100% organic cotton, providing the ultimate in plush luxuriousness. The outer cover also has grippy dots on the bottom to help the bassinet wedge stay in place all through the night. This MyBlissBaby bassinet wedge also comes with an easy carrying case that features floppy but durable handles, making it even simpler to travel with the MyBlissBaby Baby Bassinet Wedge, which mothers love. Moms have their hands full – quite literally – so anything that makes it easier to travel with baby, formula, toys, and everything else in tow is a real blessing for juggling moms. As a final gift, the MyBlissBaby Baby Bassinet Wedge comes with not one, not two, but three free e-books. The e-books are entitled “Baby Sleeping Tips for Peaceful Nights,” “Baby Weaning Plan,” and “Best Parents Guide,” respectively. These are particularly important to read for new parents and have been mentioned in reviewer’s comments as being extremely helpful during their learning years and some of the most critical and informative years of their children’s lives. Why should I consider the MyBlissBaby Baby Bassinet Wedge? If your baby is suffering from acid reflux, colic, congestion, or excessive gassiness, then you should try a bassinet wedge as a simple, natural solution to combat these issues. It’s formulated without harsh chemicals like BPA, phthalates, formaldehyde, and lead, and it provides the optimal 12-degree incline for maximum comfort and maximum relief. 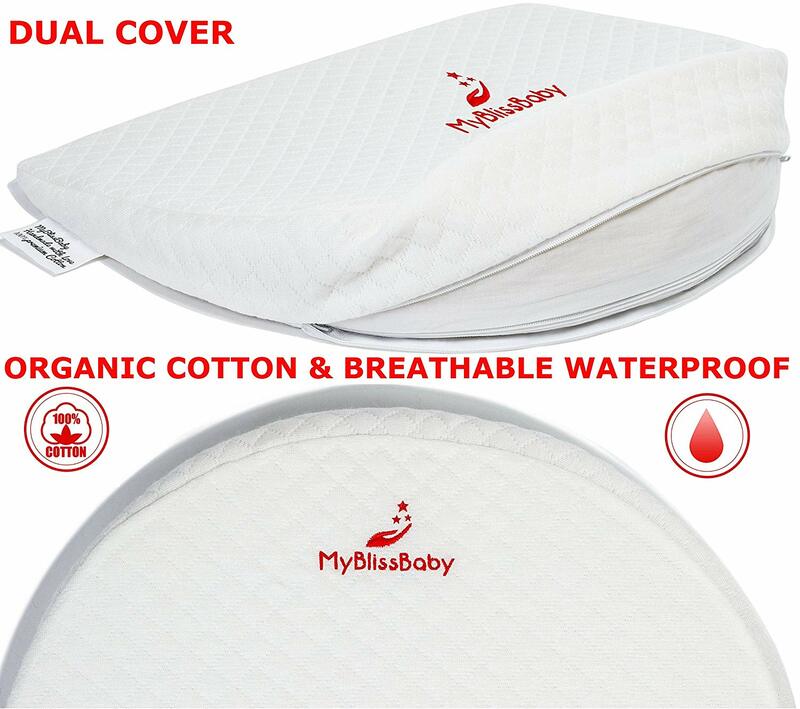 The manufacturer, MyBlissBaby, also recommends using this bassinet as lumbar or belly cushion during pregnancy, as well, so you don’t even have to wait until the baby is born to get your hands on a MyBlissBaby Baby Bassinet Wedge and start seeing relief yourself. The only downside listed in the reviews was from the occasional buyer who experienced an unpleasant smell. Generally, these things take care of themselves after letting the wedge air out before use. Fast Amazon Prime shipping makes it easy to build in some airing-out time before putting the pillow to good use. Even a couple hours should do the trick! Designed to fit all US standard bassinets, the MyBlissBaby Baby Bassinet Wedge measures 15 inches long by 12.3 inches across and is 2.6 inches high at its peak. The whole package only weights 9.6 ounces, so you know it’s easy to use both at home and on the go. Don’t let your baby suffer any longer; try the mom-approved MyBlissBaby Baby Bassinet Wedge. As a parent, taking care of your baby is your number one priority, always. When your child gets sick, it can be easy to panic and question how to handle the situation, especially with the internet that gives you so many competing opinions or false information (not to mention the always strong suggestions from family members and friends!). When it comes to the baby experiencing acid reflux, just think of a quick, easy, and natural solution that you would use for your own reflux symptom flare-ups: a wedge pillow! Wedge pillows have been proven to help reduce painful and inconvenient symptoms of acid reflux, GERD, congestion, and many digestive issues, so why not try one for your infant? Because of their unique needs, there are plenty of small pillows made just for infants who might be experiencing the discomfort of acid reflux, particularly at night. Investing in a bassinet wedge can help your child sleep more easily – and more healthily. Depending on how high up the baby is lying on the wedge (or, the bassinet mattress on top of the wedge), his or her body will be positioned at anywhere between a 12- to 14-degree angle, obviously with the head and upper body resting above the lower body to promote easier digestion and reduce symptoms of acid reflux. Pediatricians often recommend an incline of 12 degrees for newborns combating these issues, so you know that the ModTickles Premium Bassinet Baby Wedge Pillow has been made taking into account the best research available. Because of its larger size, this pillow gives you the option of placing your baby at a steeper incline when symptoms are particularly bothersome. As previously mentioned, the ModTickles Premium Bassinet Baby Wedge Pillow is definitely the epitome of luxury and quality in a bassinet wedge. Unlike its competitors, this wedge is made from high-density memory foam, while others will tend to use a cheaper, firmer foam for its density. The ModTickles Premium Bassinet Baby Wedge Pillow has married the best of both worlds in terms of comfort and durability. Perhaps it sounds a little over the top to you, but think of it this way: If you’d buy a memory foam mattress or pillow for yourself, wouldn’t you want that same level of quality for your baby? Like many other baby bassinet wedges on the market, the ModTickles Premium Bassinet Baby Wedge Pillow comes complete with two layers of protection: an inner cover and an outer cover, the latter of which is removable. Let’s start with the inner cover. Unlike some of its competition, this ModTickles wedge boasts a waterproof and stain-proof promise – others are usually just waterproof, but if you already have a child, you know how important a stain-proof cover can be! The removable outer cover is made of 100% cotton and is hypoallergenic, so you don’t have to worry about putting your baby in danger of the unknown and potential rashes or other reactions. It’s also “anti-skid,” meaning the bassinet wedge will stay put even with the fussiest of babies. This cotton cover is also easily machine washable, so you don’t have to worry about taking the time to wash it by hand. As the brand itself will tell you, safety is their first priority. The ModTickles Premium Bassinet Baby Wedge Pillow is formulated free of any harmful chemicals, including BPA, flame retardants, and lead. Customers are so happy with their purchase that the ModTickles Premium Bassinet Baby Wedge Pillow has a whopping 4.9 stars out of 5 on Amazon.com! If that’s not a convincing rating, we don’t know what is. Why should I consider the ModTickles Baby Wedge? Other bassinet wedge brands have suggested – and ModTickles does, too – using the pillow as a cushion for extra support during pregnancy. This means that it’s the perfect gift for any mother, even if she’s still just expecting. Moms don’t need to wait for the baby to be born to start using this pillow! The ModTickles Premium Bassinet Baby Wedge Pillow also comes with a special gift: a 100% cotton swaddle blanket. 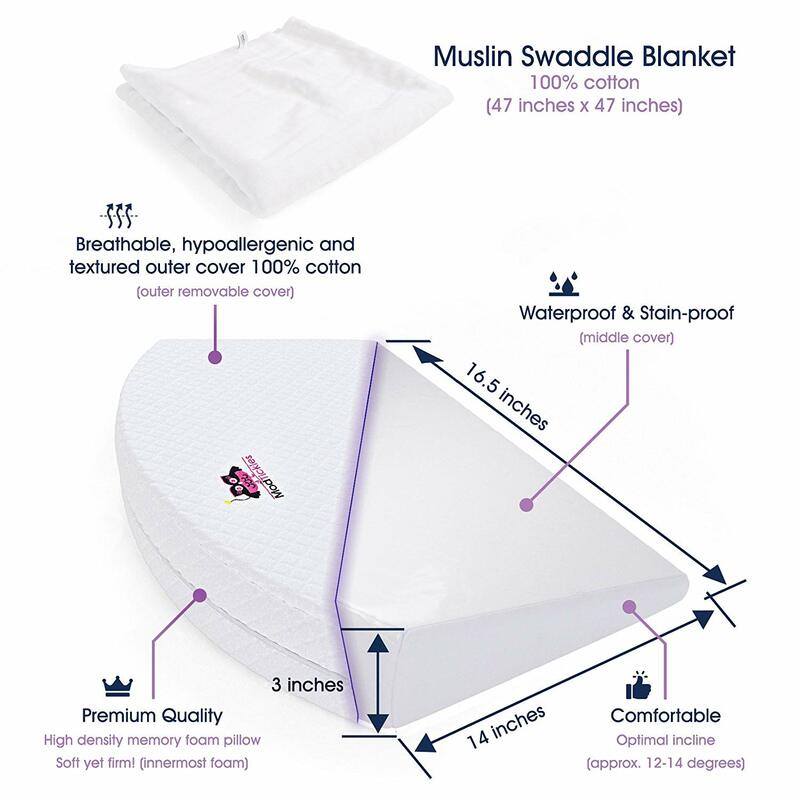 The muslin blanket is 47 inches by 47 inches, so it’s large enough to easily swaddle your newborn. Baby-related expenses add up quickly, so a free blanket is a real selling point for this bassinet wedge. The ModTickles Premium Bassinet Baby Wedge Pillow has it all: quality, comfort, safety, and stellar reviews. The best part? It’s only $29.99 on Amazon Prime, so you can order yours today and get it with fast, free shipping as a Prime member. Have you ordered yet? A good bassinet wedge has gotten your baby through the night on many occasions, whether for acid reflux symptoms, colic, gassiness, or respiratory issues. But now your baby has outgrown his or her bassinet – what can you do to keep providing relief? The hiccapop Foldable Safe Lift Universal Crib Wedge is here to help as your baby grows and begins sleeping in a crib. Even if you’ve never used a bassinet wedge for your baby and your baby begins to develop signs of acid reflux, colic, or respiratory issues, you might want to keep reading. Have you ever used a wedge pillow for yourself? Adults often sleep on wedge pillows as a proven method of reducing acid reflux (or GERD) symptoms, as well as increasing respiratory circulation and easing snoring. This is because of the scientifically designed incline at which a wedge pillow positions the body. It keeps the head and upper body elevated above the stomach, making it more difficult for pesky stomach acid to make its way up the esophagus. This positioning also promotes greater airflow to help with snoring or congestion while sleeping. Wedge pillows work because of the way the human body functions, which means these same benefits can be achieved in infants, whose functions are, of course, the same. Read on to find out how the hiccapop Foldable Safe Lift Universal Crib Wedge can help your baby! The hiccapop Foldable Safe Lift Universal Crib Wedge is like a lot of other bassinet or crib wedges, so it definitely follows industry standards. This includes the pediatrician-recommended incline of 12 degrees; it is a gentle enough slope to be comfortable on a tiny, delicate body, but it is also steep enough to optimally position the baby’s body for noticeable results. As is also typical of bassinet and crib wedges, the hiccapop Foldable Safe Lift Universal Crib Wedge includes a skid-proof bottom to help it stay in place throughout the night (this is especially beneficial for babies who toss and turn!). Note that this crib wedge is meant to be placed underneath the crib mattress to serve as an elevation wedge; this creates a more seamless and natural incline for the baby and avoids adding a new free-standing piece into the crib environment. This crib wedge measures 13.25 inches long by 27.25 inches wide and is 2.75 inches high at its highest point. This width measurement is optimal for cribs and passes federal safety regulations, so you can trust this product. The wedge is made of high-quality, dense, and durable polyurethane foam, the same material that is often used to make adult wedge pillows. It also features a waterproof cover made of hypoallergenic vinyl that is super easy to clean when those inevitable baby messes present themselves. As mentioned, the hiccapop Foldable Safe Lift Universal Crib Wedge has been proven to meet federal standards. The foam is also CertiPUR-US certified by the CPSC and CFCs for being free of PBDEs, TDCPP, and TCEP flame retardants, as well as metals like lead and mercury and formaldehyde. Speaking of certification, the hiccapop Foldable Safe Lift Universal Crib Wedge also comes with a lifetime guarantee from a reputable (and experienced!) manufacturer. Unlike some of its competitors, the packaging containing this holy grail wedge is totally ecofriendly! At a time when the effects of fossil fuel production, toxin emission, and overall global warming have never been higher or more concerning, it is imperative to seek ecofriendly options, no matter where you are in the world. Future generations will thank you for choosing an ecofriendly brand! The hiccapop Foldable Safe Lift Universal Crib Wedge also includes an important word in its name: foldable. Parents are constantly on the go, so it is important to consider a crib wedge that doesn’t make travel any more difficult than it needs to be. This crib wedge will easily fold up to make packing faster, easier, and less of a headache! It’s also extremely lightweight- especially for its size – so you won’t break your back trying to take it with you. Why should I consider the hiccapop Foldable Safe Lift Universal Crib Wedge? The hiccapop Foldable Safe Lift Universal Crib Wedge comes from an extremely reputable and practiced brand. 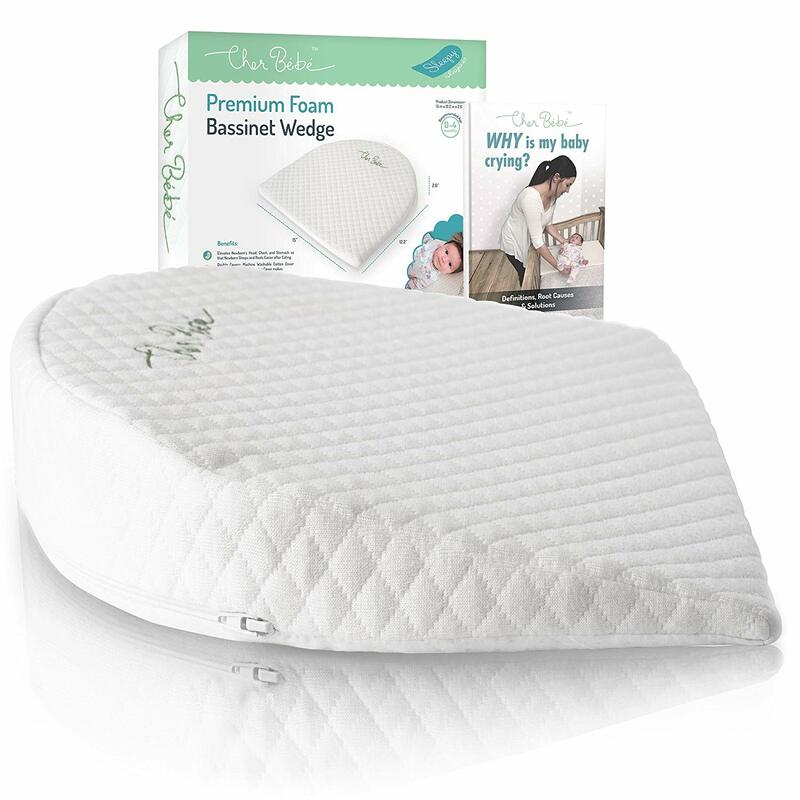 In fact, it’s so trusted that it’s become “Amazon’s Choice” (on Amazon.com) for “baby wedge pillow.” With over four million of these crib wedges sold and an Amazon consumer rating of 4.2 stars out of 5 stars, customers and hiccapop are on the same page in terms of wanting safety, quality, and transportability for all its users. Sixty-seven percent of the 425 reviews on Amazon are 5-star reviews. The wedge is made of high quality, trusted, durable foam. You can easily fold the wedge to up to half its size when traveling. The packaging is environmentally friendly. What else do you need to know? Oh, you should know that it’s also only $19.92 and available on Amazon Prime. That’s right – this massively helpful and reliable wedge is less than twenty dollars and you get it shipped to you for free! With Amazon Prime, you can get it delivered to your doorstep in as little as two days. It’s in stock right now, so be sure to check out this affordable and scientifically tested method of reducing nighttime stress for both your baby and you! You and your child will soon be getting the best sleep of your lives – all thanks to this simple wedge.